I inherited (picked up at a young age) "brushing" my hair with my fingers from my mom. Specifically, the left front or back side of the head. To my surprise and wonder Anna inherited this and started "petting" the left, back side of her head like me and her Mimi do since she was a month or two old. However, since she is just now getting some hair after being bald since birth she still pets her head but grabs tiny hairs and pulls on them VERY hard. She hasn't mastered the "finger brushing" technique just yet and is in pain but won't stop doing it. It's not as often as I play with my hair but when she is sleepy or sitting back relaxing in her car seat she will start petting the side of her head. How curious is it that she picked that up so early without really knowing what she was doing; without first seeing it and copying it. I remember I was in elementary school, 1st grade to be exact because I remember I the school I was going to and what car we were driving at the time, when I first started this habit. On the way home from school, church, whatever, I would sit in the back seat behind the driver's seat and I would watch my mom rest her elbow on the door and pull her hair through her hands over and over and over. So, I thought, "That must feel good. Let me try it." No, I don't remember what I thought but I must've thought it was neat because I started playing with my hair and now it's my own soothing habit as well. What quirks or funny things do your kids do that you or your spouse or a family member does? However, I had to come anddocument something that happened that I am oh so very thankful for: Blake became a Christian and has decided he wants to be baptized. This is something I, and many people, have been praying for for a very long time. God's timing and plan is something that we cannot control - even though at times I tried. The moment(s) I let go and let God handle the situation were the moments when Blake willingly wanted to know more about him and he willingly asked to do a Bible Study with my dad and his brother and he willingly came to know the Lord on his own. It's something a lot of people had a hand in but no one could make him do. For 8 years Blake and I have been together and for those 8 years I prayed, I cried, we argued over religion and biblical perspectives on marriage, raising children, and life in general. I begged him to come to church with me and I begged him to do Bible Studies but on his own he decided it was time. And, that's exactly how it should be. Me, being the control freak that I am, had some very difficult moments. I wanted Blake to know God's love so badly. I wanted him to just "get it!" I didn't know if it would ever happen but I'm so glad that it did. I was in an un-equally yoked marriage. I knew going into this that Blake didn't believe in Jesus. He wasn't agnostic or atheist; he just didn't believe some parts of the Bible but he did believe in God. He talked to him and obviously felt something. I had a small emotional break-down (lol...it wasn't that bad) about a year into our marriage. I knew this major difference between our Godly views was going to be an issue in our marriage and when we decided to have children. I was really sad and depressed about it. But, I knew I had done something God has directed us not to do; do not be un-equally yoked with a non-believer. Well, I had already said my vows and I do love Blake so there's no turning back, no leaving on account of something I knew from the beginning. Two wrongs don't make a right and I knew that no matter the arguments or disagreements there was no leaving Blake because of this. However, how I dealt with it could be changed. Accept my mistake, ask for forgiveness, work on my own relationship with God, and pray for my husband. Over the years Blake slowly asked more and more questions and then started reading his Bible. After our daughter was born something clicked and he wanted to start a Bible Study with my dad and ask his brother, someone who has also been such a prayer warrior and someone for Blake to talk to about things, so they started at the beginning: Genesis. Over about the course of a year they read and studied and examined the Old Testament. During the course of the study it ended up being just Blake and my dad meeting each week but as the got to the end of the Old Testament Blake stopped calling my dad and meeting him on Sunday evenings. I asked if they decided to stop and Blake just said, "No, our schedules just got busy..."
Many nights we would talk about things and what he was learning and his new perspective on things. One night, it came out that he was kind of scared to start the New Testament and had been dragging his feet. He was at the point where he said that he knew what decision he wanted to make but now it was right in front of him. Does he accept jesus as his personal Lord and Savior? All this studying, was it for nothing? But, he picked up his Bible again each evening before bed and started the New Testament. On December 1st, on our way back from the most perfect date night spent together in Austin, the radio was playing K-Love, I was sleeping in the passenger seat and he was praying and said he felt God hug his soul. How totally awesome and beautiful is that? While he was thanking God for a perfect night and for all the things in life, talking to Him about life he said he felt like God hugged his soul. I am still like, "WOW!" How long have I been "asleep" in my own walk?! I want to feel like God hugged my soul! I was so happy hearing him tell me this. It was such an awesome feeling seeing him tell me how he felt. So, soon, when it warms up in March or April, he wants to be baptized out at his families ranch in London, Texas. This makes his mom very happy; it's a place she loves to be. And, it's God's beauty all around. After he told my dad he asked him if he would baptize him and of course Dad said yes. Dad has baptized all of us in our family except for Chris, my sister's husband, who was already baptized in his own church he grew up in. I can't wait and I'm so happy I will be there to witness it, and that our daughter will be there. She'll be only 18 months old, not sure she will remember it, but regardless. It's a new life and fresh start for our little family. In our evening chats Blake asked that I re-dedicate my life. He knows that by him just asking me to do it can't make me; I have to want to do it and want to go along on this journey and change along with him, and I'm totally willing to do that. I know over the years I have wandered from where I need to be with Him. It's funny. Here I was the entire time the Christian, a preacher's daughter, and now Blake, at the time a non-believer, by studying the Word knew, and still knows more about the Bible then I did/do. He's asked that I spend time in the Word and really focus on loving other people and being happy; just like Jesus tells us to do. Blake's sister-in-law, after telling her how silly I feel because Blake knows more than me and I feel I should, being the Christian in the relationship, said something that was great. She said, "Now that he is a believer and knows so much because he's been studying; now he's the head of the spiritual household; just as it should be." How awesome is that? I have longed to be able to turn to Blake, my husband and talk to him about spiritual things and get his advice and guidance, and over the past year or so I've been able to do that. God gives us so many gifts but that is one I'm so thankful for! Sunday afternoon Mimi and I took a little one hour road trip with Miss Anna to Love Creek Orchards Pumpkin Patch in Medina. Anna had the most fun! We met one of her little people friends there, Caleb, and his parents Stephanie and Billy (our friends :))! 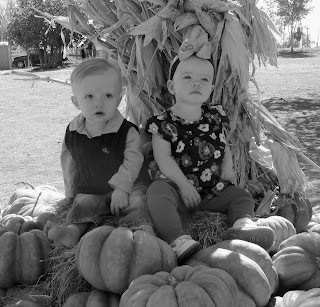 At first they weren't really sure what to do when we sat them on a bale of hay in the middle of a mound of Cinderella Pumpkins. But, what a site it was to watch them soak in everything around them. We got some cute pictures of their puzzled faces because I was "yelling" at them, acting like a fool, so they'd look at the camera. As the afternoon continued they got used to their new fall surroundings and wanted to touch, feel and play with all the pumpkins, hay and corn stalks that surrounded them. Can you imagine being a 2 foot tall little person seeing pumpkins for the first time? What is that semi-round bumpy thing? 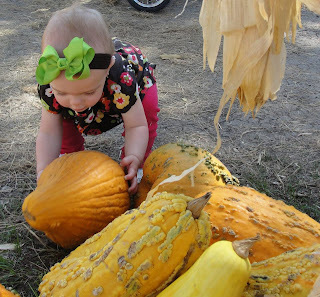 Anna wanted to pick some of them up but most weighed more than she did but she gave it her best effort and had fun practicing her punkin chunkin skills! Anna wanted to play with them so badly that she didn't want to be pushed in her stroller. She wanted down to walk amoungst the orange, white, blue and grey pumpkins and warty gourds. 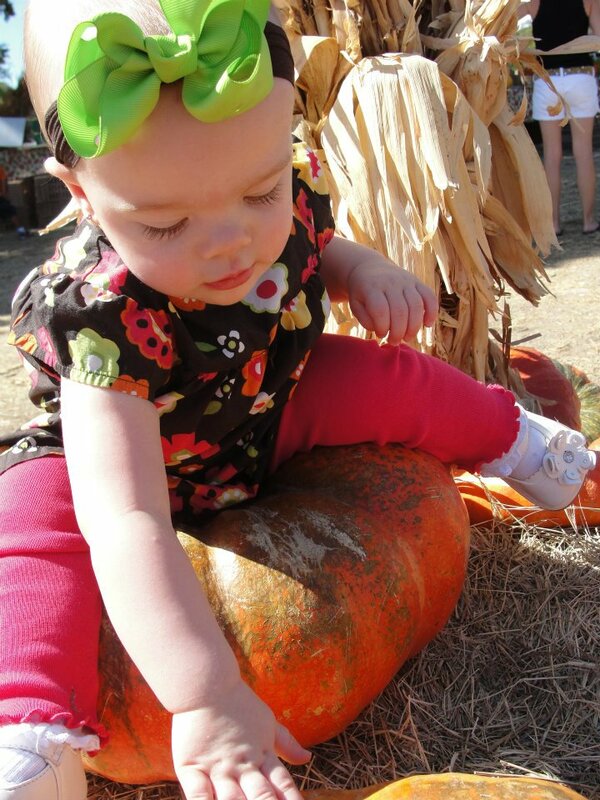 She loved feeling the bumpy ones and had the most fun walking around. I'm so sad I didn't get a video of her but I got some good pictures of her and a lot of shots of her in awe of the pumpkins and cute people watching pictures where she's gazing off into the distance. 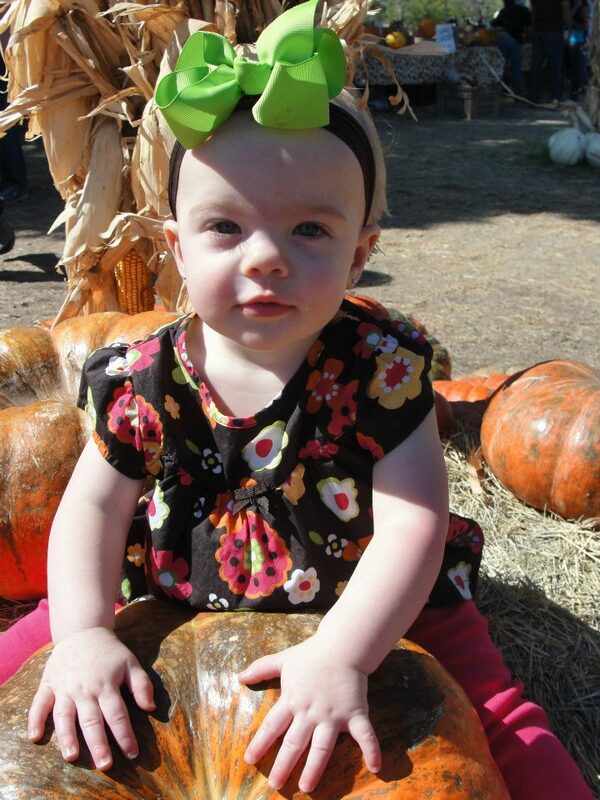 Ok, back to the pumpkin patch...I'm definetly taking Anna back next year. She'll be 27 months and I know will have even more fun. There was a ton of stuff for little ones to do! There's a petting zoo, a pond with ducks swimming, a little hay maze, tractor rides, food booths, paint-your-own pumpkins and much more. I'd highly recommend it. I really wish we were going this weekend because it's supposed to be cool and one of her crotched little beanie hats would make for some precious pictures! The other day Blake and I were talking about how we love watching Anna grow and learn new things. It is so exciting just watching her take everything in and try it out for herself. We got to talking about our relationship with God and how the closest thing we can relate to our relationship with Him is the same as a parent/child one. Well, we all know that, that he is our Father, but Blake put it in a way that really made it clear for me. Just as we know Anna is going to grow taller and learn to walk and learn new words, God knows we are going to learn more about him by spending time with Him. Just like we spend as much possible time with Anna God wants to spend that same amount of time with us. Watching us learn and grow. This is something I personally need to work on; spending more time in His word and talking with Him. I love learning and growing with Blake and watching each of us grow in our relationship with Him. I love Pinterest. It's a wonderful way to waste a lot of time. But, gathering great ideas and want-to-dos for the future is so fun. My friend Jennifer turned me onto it. Thanks Jiffy! :)Pinning, re-pinning, liking and finding new things I have decided my style is well, eclectic. Maybe, from an HGTV quiz long ago, I'm "Transitional-Traditional" - a bit of old meets traditional and new but not modern. I know I get a lot of my style taste from my mom. She's pretty traditional but has tons of old family things and she's really a great decorator. She has a knack for it and I've always loved her taste. At first glance I'm more traditional. I like warm hues - brown and tans, olive and sage greens, deep reds and darker woods. But, I love light airy spaces with a little charm. Nothing too up tight but for sure nothing too modern. I love shabby chic and antique - mainly family heirlooms that mean something to me and have a past that I know about. I love the old tupperware and pyrex that was once white but is now a slight cooked-brown and the cute designs on them now scratched off from my Granny. I like the old milk glass and painted rose china from my Lulu. I like the wooden corner shelf that I inherited from also from my Lulu. I love old things from family. I like mixing metals like oil rubbed bronze or copper with pewter or touches of silver and gold together. I like adding a touch of seaside with conch shells collected from a beach trip my Papa took. When my aunt told me they were Papa's seashells I couldn't imagine him. On a beach. I have no doubt he was still wearing his wranglers, boots, sweat stained cowboy hat, and starched, plaid, long sleeve pearl snap even on the sandy shores of Texas in the hot humid summer. Just like he did year-round working cattle and hanging out on his farm or one of his many brothers farms. But, I digress. Back to the shells. Displayed in a bowl or glass hurricane with a candle in the middle. Of course the bowl is a traditional oval, deep bowl but with quirky contents that might not match the room exactly but adds a little touch of nature. When I first started dating Blake and eventually moved into his batchelor pad I immedietly wanted to change everything. He really did like the walls all builder-white and he put stainless steel outlet covers on everything. A lot of his furniture was black and nothing was me. But, he really doesn't care and does like the darker, more traditional woods. He did pick out our bed. A dark wood sleigh bed. Very traditional. I was surprised but I liked it. I like that in our closet we have his child-hood dresser. Like I said, I like things that have a history. I love this one! I love all Kid Kraft products but this is my favorite. And, I guess that's all I have. I don't really like the plastic ones I have found. I still have my kitchen I got for Christmas about 25-26 years ago. All teh grandkids STILL play with it. It is a Fisher Price and I still love it. 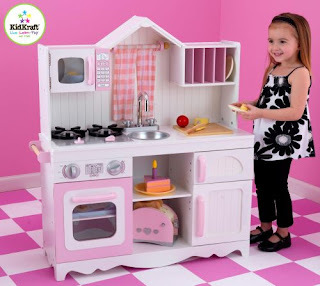 :) Hopefully, Anna will get lots and lots of years of play with her little kitchen. What are you planning on getting your kiddos for Christmas? And, anyone else in your life? All the other people in my life are still on a list with nothing beside their name...gotta get to shoppin'! 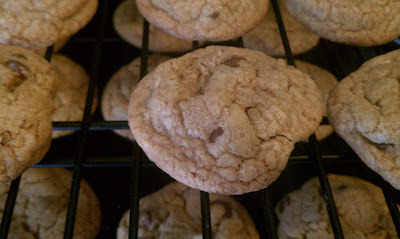 See previous post for delicious recipe for the perfect chocolate chip cookie! 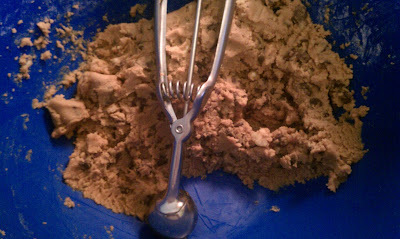 In 2007 I found the most perfect chocolate chip cookie recipe after being on a quest since I was at least 7. I love baking but after many ccc baking failures I gave up. I know the year was 2007 because it was a month before our wedding and I got volun-told to bake some ccc for a work pot luck. So, to the internet I headed and i found one that seemed promising from the description and it fulfilled it's promise by being chewey and soft in the center and the perfect crisp on the outside. Even days later, if they last that long, they are still chewey and have that crisp edge. So, I guess I will share it with you. I found it on allrecipes.com so it isn't like you couldn't find it on your own. It isn't a super secret recipe passed down from generation to generation but I hope to pass it on to Anna and one day, far, far away I hope share it with my grandbabies. On 9/25/2007, the date on the paper I printed it had received 5 out of 5 stars by 1,014 people. So, every one of those people gave it 5 stars. You will too. However, if you do not have baking soda please don't attempt to make these. That is the secret. Here you go! Bake about 10 minutes or just until they get firm and slightly brown. Pull them out and let them cool a few minutes on the baking sheets before transferring to cooling racks then an air gift canister. Enjoy! 1. the faculty or sense by which sound is perceived. 2. the act of perceiving sound. 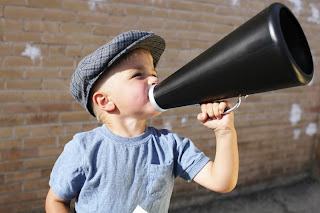 2. to pay attention; heed; obey (often followed by to ): Children don't always listen to their parents. Recently, I needed to find out how much I owed on our water bill so I could set up my web bill pay so I called our city municipal office and I asked the lady who answered the phone that I needed to know the amount I owed for that month. She asked me my account number and I gave it to her. "Ma'am, you're calling the City of Boerne." she sweetly replied. "I know and I just need to know how much our bill is so I can set up my payment to be sent in on time." I told her. Once again her sweet voice said, "Ma'am, you're calling the City of Boerne." I know that I made one of my "Seriously??" faces even though she couldn't see me. She had already told me this and I heard her clearly the first time. I tried explaining it another way by saying, "I normally drop my payment off but I'm setting up my web bill pay and now I'm going to have the bank send it. I forgot what it is every month so I need to find that out so I can get my payment in on time." Again, she repeated for the third time, "Ma'am, you're calling the City of Boerne." Now, I was getting kind of annoyed. Was the sweet voice on the other line really just a parrot that they trained to only repeat one sentence and not a real, live person? I grew even more annoyed and I said, "My name is Holly Kallemyn. I live at ___street address___. I pay you every month and my checks are being deposited by someone because they are clearing my account. I can look at my past bank statments but I lost the bill you send in the mail and I just need to know the amount." Hopefully, I thought, she'll give me the amount I owe and I can get on with my day. This time the sweet voice started out the same with, "Ma'am" but she must've been a real live person because she said something other than "You're calling the City of Boerne. "Ma'am, you are outside of the Boerne City Limits. You need to call Kendall County Utility and their numbers is ___________." Yeah, I immedietly felt like the biggest idiot and I quickly hung up the phone. And, the best part was I had given her my name and address. She now knows who this idiot is on the other end of the line was. Great. Has this ever happened to you? Not the above scenario per say; I'm assuming you all KNOW who you pay every month and where you live. ;) But, when you are hearing what someone is saying but you aren't really listening? I struggle with this a lot. I blame it on my self-diagnosed ADD most of the time but I find myself in this situations more often then not. Sad, I know. But, I leave conversations and think, "what did they say?" or "what did they mean when they said ______?" I didn't listen or ask the right questions. It's easy to be so busy with whatever it is that is consuming your own thoughts to not really listen to people clearly which can cause more trouble than it's worth at times. You could've just focused on another person for 10 or 15 minutes, or a mere couple of minutes, instead of hearing your own thoughts. Now, don't get me wrong, I'm not always in my own la-la land and ignoring you or the people I talk to all the time but I think this is something everyone struggles with; REALLY hearing, REALLY listening to people. There are people in our lives who really just want to be heard. Was it The Great Oprah (ha-ha) who said, "Everyone just wants to be heard." But, she is right on that one. Everyone just wants someone to listen to them. This is something I'm really working on. Stopping whatever it is I have in my own life to focus on the people who I love and cherish. Or, anyone, even strangers. What things do you struggle with everyday? Hopefully, I am not the only one who has found themself in a similar situation such as this. What am I missing everyday by only focusing on myself and my own problems, projects, or events? And, please. The next time you see me don't think I'm not listening to you. :) This was just one funny example that made me think how often we all communicate but we might miss something VERY important along the way. Yesterday Blake and I went with his brother Wade and sister-in-law Tiffany to the inaugural UTSA football game. It was fun! We tail-gated and sat on the front row at the game on the 40 yard line. There was 56,000 people and all the fans were loud, the band played and the cheerleaders ra-ra'd! But, in order to have all that fun we had to leave Anna behind. We normally leave her with my parents and if they aren't available then she gets to spend some time with Blake's parents. Well, both of the grandparents were out of town for the holiday weekend so we got a baby-sitter. I'm going to call her Fran. Fran is great. Anna loves her because she knows her. Fran was one of her first teachers at day care. She's loving, sweet with the kiddos and I had no worries leaving Anna with Fran. We got back about an hour earlier than expected but I had written her a check for the full time we had said we'd be gone. When I handed Fran the check she said, "After being with Anna today and seeing where you come from and into your family's life (she watched Anna at my parent's house because our A/C got replaced yesterday) and being a fellow preacher's daughter I want to bless you and only take half of this. I can see your family has blessed many people and I want to do that for you." WOW! I was literally brought to tears. How often are we witnessing not only to non-believers but to other believers? Those that we know already believe it's easy to over-look them sometimes. I mean, they already believe in Jesus and what good things he's about. We have mission trips and clothing drives and on and on and on to reach those who don't believe in Jesus. That's great! That is what He called us to do. But, by her blessing me, another believer, it opened my eyes and reminded me how we need to lift each other up everyday. Bless each other and encourage one another every single day. Something as simple as that made a huge impact on me and the rest of the evening I just felt so undeserving of that. I know that was not her intention and I wasn't having a pity party. I just know what things I need to work on and how I've strayed away from time to time and I'm not the best example and it brought me back. In Revelation 2:4 in the letter written to the church of Ephesus He says, "But I have this against you, that you have abandoned the love you had at first." (ESV) After going through Beth Moore's study on Revelation and referencing various other versus I have come to know that the verse hits home with me. My first love; when I first believed and trusted Jesus as my Lord and savior. I was on fire and excited and ready to share with every single person what God has done in my life. You long to learn more about Jesus and everything is new and fresh. However, it's easy to let this fire burn out. Every day routines and all of life's events can all take over and make it harder to stay on track. I think this is a bit normal. People are human and God never said it would be easy. Jeremiah 2:2 says, "I remember your devotion of your youth, your love as a bride, how you followed med in the wilderness in a land not sown." Your relationship with Christ is like that of any other relationship with your spouse, your family, your friends, everyone. You have to spend time with one another to get to know each other more. You have to sacrifice doing some things in life so you can spend time with those you love and chose to have a relationship with. The blessing I received from Fran was a great one. It wasn't at all about saving money for a baby-sitter. It was about being encouraged by another believer. Something that provided a great example for me to bless others all around me. Great. Anna has hand foot mouth virus. Bless her heart. Poor baby has not been feeling well since yesterday and her little tummy is hurting and she's running a fever and things just aren't going well for us!! Monday evening I came home to a toasty 98 degree house. No, not the boy band, the temperature. So, we've been at our parents and hopefully by Friday or Saturday we can get the new unit installed. I'm ready to be home. I can go home anytime but I'm ready to be home in the a/c. It's just been a wonderful week let me tell you! This past month has been rough...stomach viruses for Blake then me, Anna was sick earlier in the month, then I was off for a week but wore myself out then the a/c and now Anna has HFM. Praying for a better, happier, healthier September! We had Anna's one year well-check this morning and all went well. She's staying right around the 25th to 30th percentile for her age weighing in at 20 lbs 2 ounces, and she is 28 inches long. Her head circumference is written down but I forgot it but it's also right around the 25th percentile. So, she's all proportionate and all is well. She got her vaccines and that didn't go over too well at all. She normally cries but then once we pick her up she calms down but she cried the whole time we got her re-dressed and all the way out to the car until we started going and had her spanish guitar turned on. :) She fell asleep on the way to daycare, which was right around morning nap time, so they fed her and put her to bed. I hate the shots. I wish that sometimes kiddos could really understand what was going on and that it is for their health and that we aren't trying to torture them. She knows now that when we go to the doctor it doesn't mean good, happy things are about to happen. Poor baby has been in and out of the doctor's and hospitals too much in her first little life...NICU, every month well visits to check her weight gain, allergy doctors, blood tests, eye procedures, RSV hospital stay, etc...ugh. I hate it all. But, we have to go back at the end of September for her flu vaccine because they haven't received them for babies yet but if we can get her through the fall and winter without being sick it will be really awesome. A cold here and there is expected but the doctor really wants her lungs to stay clear since they are still recovering from the RSV. But, we have our trusty breathing treatment machine...let's just hope we don't have to use it. Twice daily for 5 months was long enough. So, she's healthy and we talked about weaning from the bottle and introducing whole milk and all that fun growing up stuff. Our doctor said he cut formula cold turkey for his kids but I decided to start off a week of half and half and then slowly adding more milk and less formula over the next week. We already have one of her feedings from a sippy so now it's just the nap time and bed time bottle I'm worried about. He suggested giving her the milk in her sippy and if she HAS to have her bottle then brush her teeth like normal and fill the bottle with water and she'll slowly realize that it's the sippy that has the good stuff. We will see... Also, as we all know it's OK to let a baby cry and we don't give in to their cries just because they want something. Just because a kid wants candy and cries for it we don't give in and it's the same with this. Of course, making sure in this case, that she is getting her liquids and calorie and fat nutrition somehow but just not from the bottle. I hope this is an easy transition...time will tell. 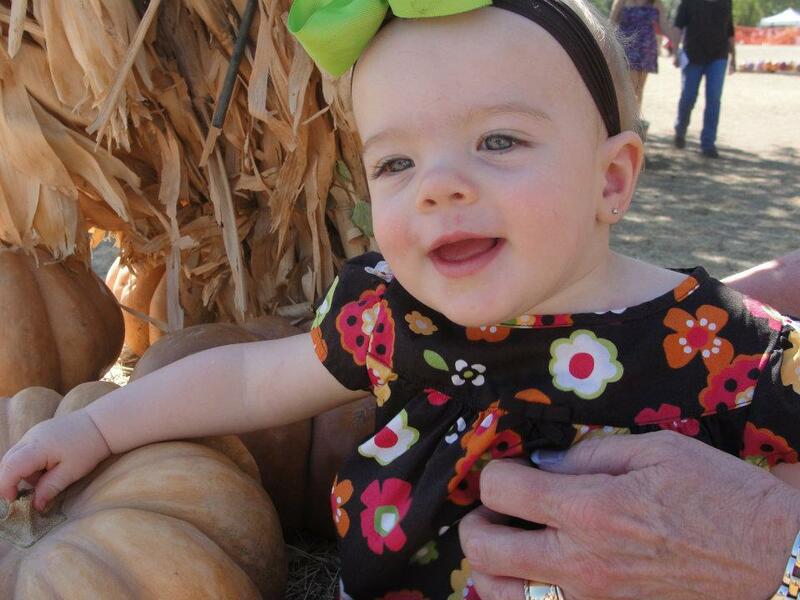 Looking forward to seeing her learn new things...walking, saying more words, learning all sorts of new things!! They grow way too quickly but it certainly is the most fun! One Little Candle, One Little Cake, One Little Year to Celebrate! This will be a picture blog of Anna's First Birthday Celebration. BUT, we all had so much fun, I loved preparing and prepping and crafting and I was happy with how her party turned out. I'm so thankful for everyone who came and helped us celebrate Anna's little first year of life! This is Anna's worst nightmare!!! Ha. I got cute little stickers with Anna's picture to put on the bags for the candy bar. They say "Thank You!" I set out some photo books I made since Anna was born for people to look through and see how much she's grown and changed in the last year. I used mostly all of my Granny's old Ball Mason Jars as lemonade and drinking glasses and as flower vases. I'm so sad she is no longer with us but thankful she was a pack-rat ;) and I could have something of hers there with us. This is my niece Emma and my second cousin Luke. 3 weeks and 2 days old! He was the youngest party attender! Ok, I made a little party hat for Anna. She HATED it. It made for some funny pictures but...did I mention she hated it?! LOL! I set up two little wading pools for the babies to splash and play and they had a great time!